I love my tea kettle. 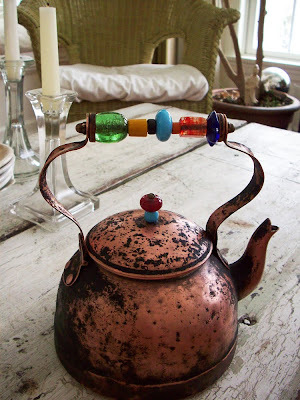 When I was a young woman in the seventies, I lusted over the beautiful old copper tea kettles I'd see in magazines, so I was thrilled beyond belief when my then mother-in-law gave me a shiny new kettle as a gift. 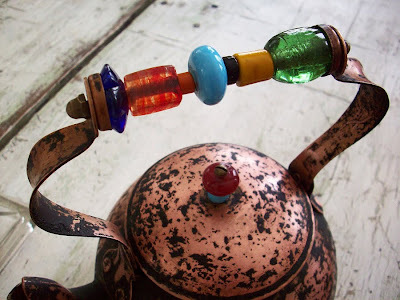 What she didn't know--being all about keeping everything squeaky clean--was that to me, my new kettle was a new baby, a smooth, spotless vessel awaiting its history; a gradual building up and breaking down of its surface. When she saw her gift a few years later she insisted I "Throw out that dirty thing! ", but I didn't throw it out, it was just getting good! 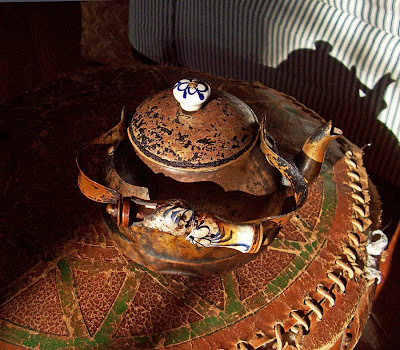 Years later, the blue and white ceramic handle cracked, but it still worked fine--if I held it just so--so on we went together my tea kettle and me through the years, till a few days ago, when the handle crumbled into pieces. Was it finally time to let go of my old friend? Would I like it if my loved ones let go of me because of my bumps and dings? So, I went searching through my studio and found some large glass beads that I thought might do the trick. After a quick scrub in honor of her new handle and knob, here's my tea kettle, up from the ashes. Does anyone remember the big jars of fermented fruit--"Vintage Fruit Sauce" to my teetotaler mother, aunts and the Red Star Yeast Company--that sat proudly in big apothecary jars on many kitchen counters in the seventies? 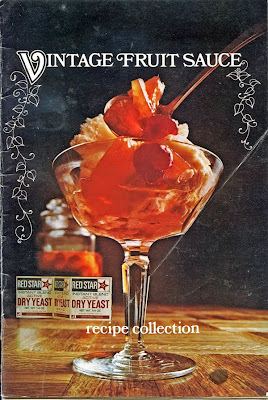 From the zingy taste of the jewel colored stuff, it was obvious that "Vintage Fruit Sauce" was mildly alcoholic, but my lady relatives flatly refused to believe they were happily consuming boozy fruit over their ice cream, in their cake...even eaten on its own by the spoonful. I've never been there, but when I think of Greece, I always think of sunshine. Getting to know Maria, I've come to the conclusion that some of that sunshine radiates from her. She's funny and charming, and talented and generous, and if you ask her what she sees when she looks out her window, she'll tell you she has a view of the Acropolis...can you IMAGINE?!!! Anyway, a couple of months ago, Maria wrote to me. She'd seen my work on flickr, and asked if I'd like to take part in a project she was going to post on her blog, and would I send her a photo of my hand/hands, and said there would be questions....later. Pretty sketchy info, but she seemed so sweet, and I was curious--not to mention flattered--so I said I'd do it. Since then I've gotten to know more about Maria and her beautiful work. When one of her stuffed beings called to me recently, I asked if it was available, and lucky for me it was, so Maria and I decided to do a trade; she'd send me "ms flo", and I'd send her one of my Lollies, named "Olive". Of course we sent each other some other little goodies, which is always fun when you trade. I sent Maria some vintage needlework stuff and some other bits of this-and-that, tucked inside a wrapper from my favorite soap, "Tabac", which is made in Greece..."coals to Newcastle"...which amused Maria. 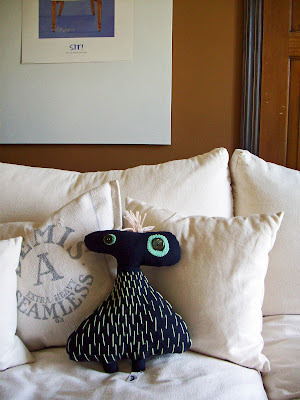 Along with "ms flo", Maria sent me one of her little fabric owls, who kept "ms flo" company during her long trip to my house, and especially precious to me are the beautiful smooth pebbles from three different Greek islands, that I'll add to my collection. I may never make it to Greece, but a little bit of Greece has come to me. 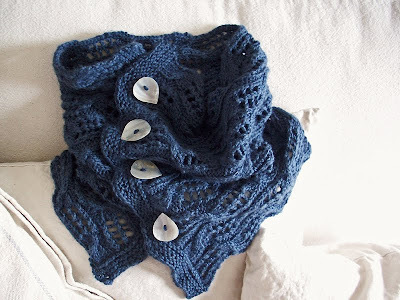 If you haven't discovered Maria yet, you can check out her blog, psarokokalostudio, where you can find a link to her etsy shop--her necklaces are GORGEOUS and totally different from anything you've seen before. You can take a peek into her sunny life on flickr here. Last, but certainly not least, if you're reading this Maria, thank you for liking my work well enough to make me part of your wonderful project, and for giving me a chance to know you better. I've been in love with the idea of cuffs for a year or two now, and I made some sketches about a year ago, but didn't get around to making my own version of a cuff till a few days ago. I'm hooked. 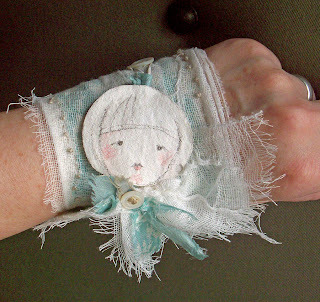 Not only are cuffs a cool thing to wear on your wrist, they're a mini canvas just waiting to be created upon. 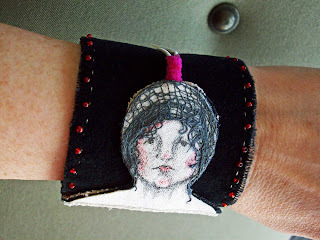 Since I use lots of faces in my work, my take on cuffs is a long, straight body, with a head on top. I didn't expect to be so taken with making these little people, but I am. Here are the first two. 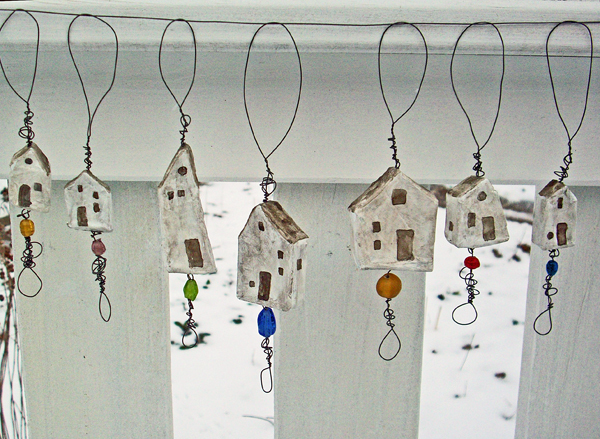 First it was my Reincarnated Pasta Box Houses, then I made Tiny Houses out of the pasta box scraps, then someone suggested the ornaments I made out of them looked like "earrings", and I found myself making teeny tiny houses. 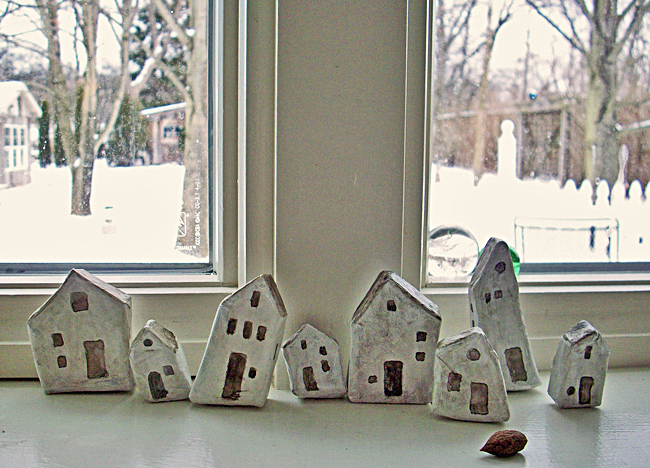 I decided to use polyclay for the latest houses because I thought it'd be more durable for earrings than papermache. 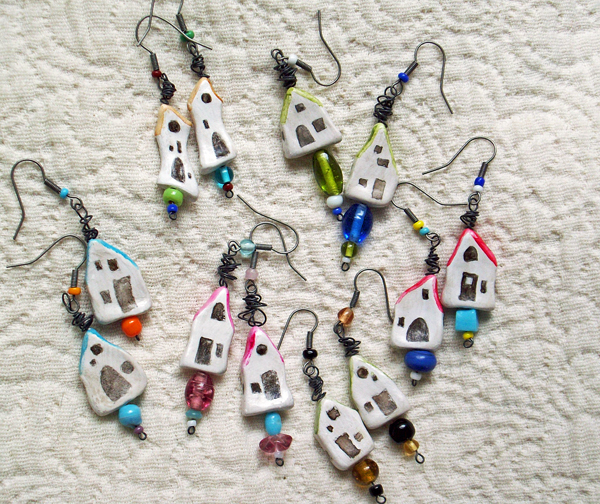 So I made a dozen 1/2" x 1" houses, painted them, strung them--along with some glass beads--onto wire, added ear wires, and I had six pairs of Teeny Tiny House Earrings for my Etsy shop. Well, five pairs, I kept the pink and aqua pair for myself. I may never wear them, but they'll look great in my soft aqua bathroom...when I get it painted that is. I think I've taken this house shrinking idea as far as I want to. ULLABENULLA has done it again! 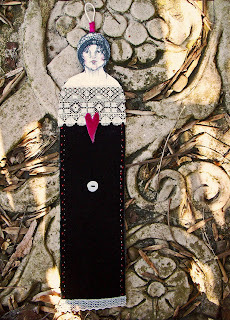 In January, the lovely and very talented Ulla, featured my "Clown" figure on her amazing blog. 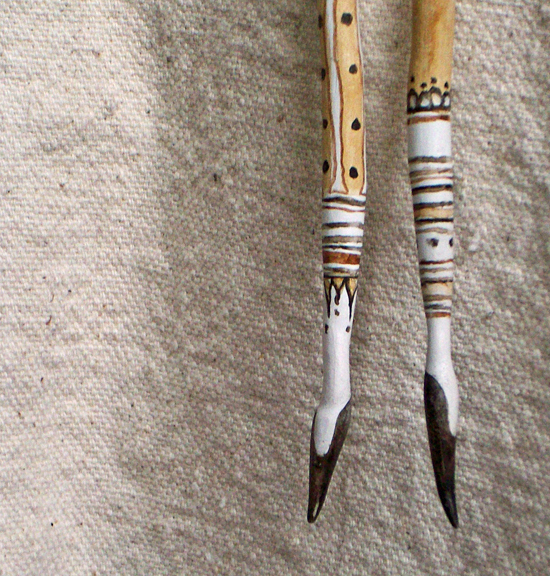 She recently bought a pair of my Lollie Leg Earrings, and surprise, there they are, caught under a magical fortune teller tea cup on her blog, ULLABENULLA! I'm almost too thrilled to brag! Pete Seeger sang, "Little boxes on the hillside, Little houses made of ticky tacky". I'm making little houses, but they're not made of "ticky tacky", they're made from empty pasta boxes and cereal boxes, with a cornstarch box thrown in for good measure. 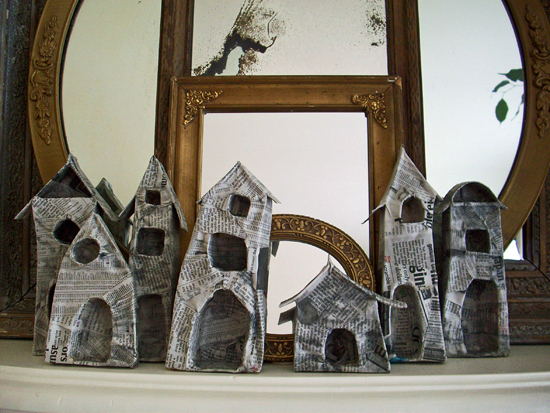 I make Niche Lollie bodies from empty boxes, but these are my first houses, and I'm enjoying the process and progress, so I thought I'd share what I'm doing here on my blog, in case anyone else is interested in following my 'Little Houses'. 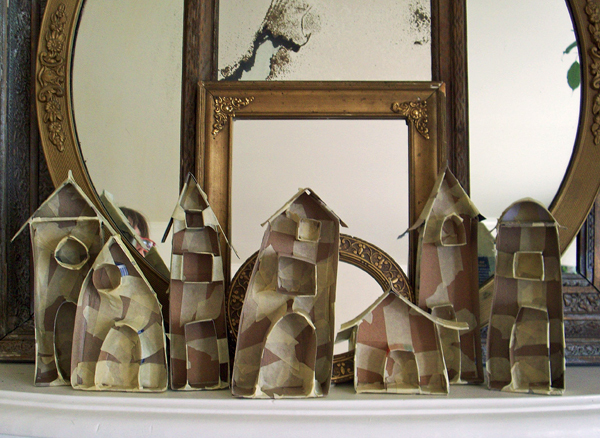 The first photo is of the house frameworks made from pieces cut from boxes, taped into shape. Today I ripped newspaper into strips, got wallpaper paste all over my hands, and covered the houses in their first layer of paper. I kind of miss the way they looked before, but I doubt many other people would appreciate their masking tape look. They're drying on the mantel, so I should be able to add more paper tomorrow. The second and following layers will go faster than the first. I think I'll add a few chimneys, and maybe a birdhouse or two. Shutters? Doors? Little people? We'll see. I guess I'm in house building mode, because I took the bits and pieces left over from making the pasta box houses, and shaped them into some tiny houses. These are only one or two inches tall. I've got all sorts of ideas for what I could do with them, but I'll wait to share till I've tried them. Wouldn't want to show my disasters, would I? I gave my tiny houses doors, windows and roofs this morning, but they're not quite finished, so back to work. I thought I'd hang each little house from a loop of colored string, but when I tried it, I didn't like the look, then I remembered wire. I don't know how some people can do precise wire shaping, but I'm excellent at totally imprecise wire shaping, so once I got a length of thin wire strung down through the center of each tiny house--the most difficult part of the whole house building project--I twisted and looped till I liked the look. I thought the houses looked a little bland, so I added a colored glass bead to the bottom of each one. I like these little houses. 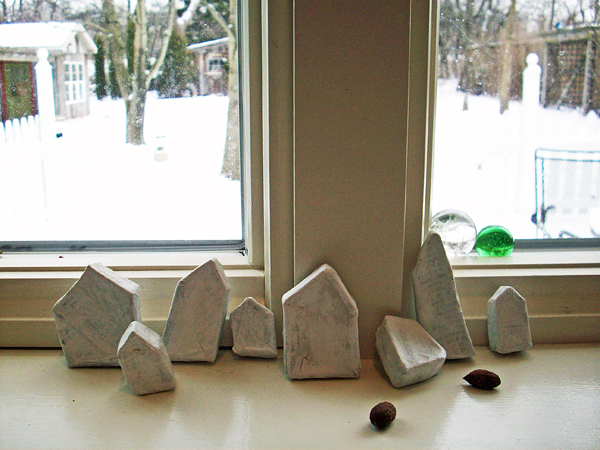 I've got several other projects that need finishing, but when they're done, I'm going to make more tiny little houses.